You already heard me declare my love for this deconstructed denim skirt in this post a couple weeks back, but it’s not the only item I’ve purchased recently by Levi’s… I think we’re all pretty used to stretch denim as the norm these days, but there has been more interest in the original, stiff variety as of late. I decided to try out a pair and did not expect to like them, but call me a convert, because I’m hooked! While stretchy denim is definitely more comfortable in terms of pliability, there’s something so authentic and cool about a pair of jeans like this. 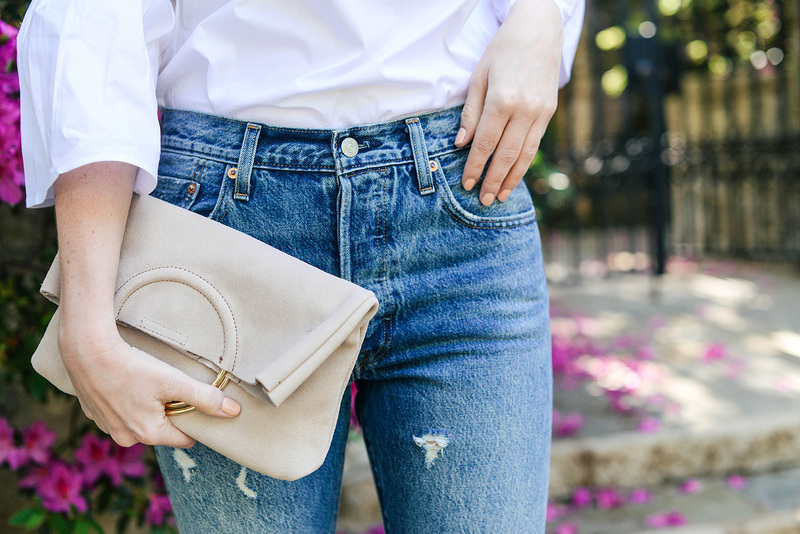 The high-waisted style may make you think “mom jean”, but I’m all over it. 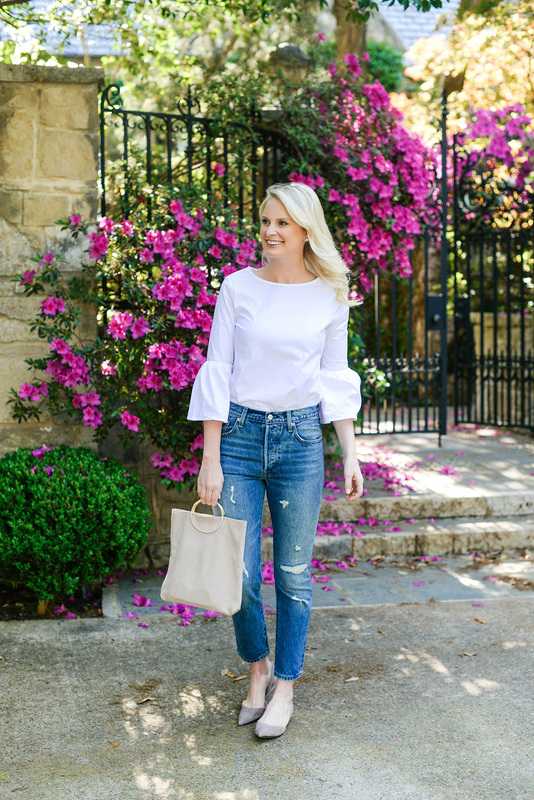 Plus, while they’re technically being called a skinny jean, these jeans really have more of a straight-leg style at the ankle – definitely on trend in that regard! Also, I picked up another fab white top. Are you surprised? A girl can never have too many! This one happens to be under $65 and looks just as good tucked in as it does left out. Pair it with black slacks for work or tuck it into a fun skirt for date night! It comes in four other colors too, but the white is the most fresh and versatile year-round. Don’t you just love the sleeves?! Top: Gibson, Jeans: Levi’s, Bag: Sole Society, Shoes: Paul Andrew, Sunglasses: Quay, Diamond Earrings, Nail Polish: OPI Infinity Shine in Don’t Ever Stop! These jeans are so cute! Also, I spent yesterday watching some of your YouTube videos. 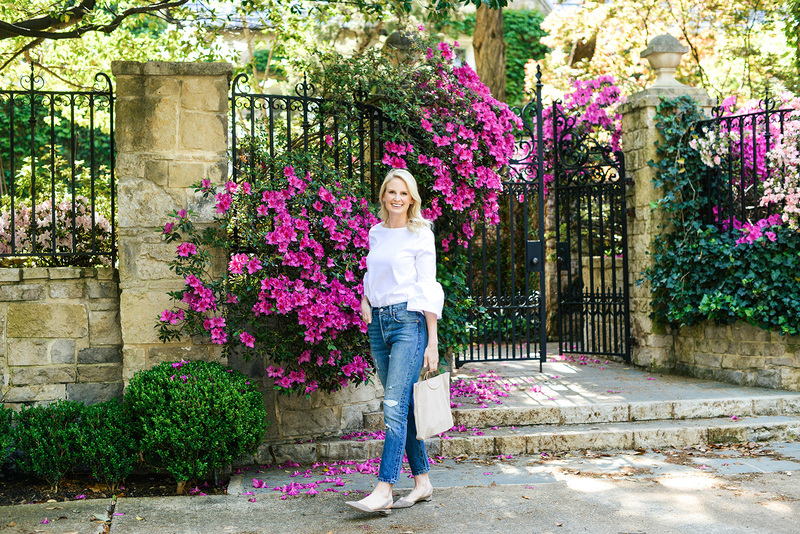 Love your tips for buying luxury handbags! I LOVEEEE this top on you! Such a cute spring look. Love the denim! And I am obsessed with this gorgeous floral location! Just beautiful. 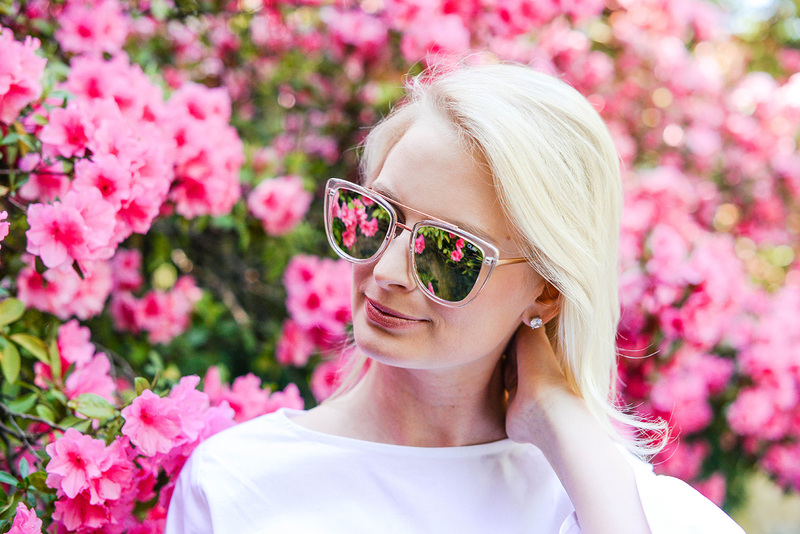 Such a cute yet simple outfit for spring, those sunnies are super adorbs! I love the style of the jeans! The fit and style looks amazing! OMG you + the background are gorgeous!!! Love the high waisted style on you! i am a denim addict and have been leaning more towards levis lately. these fit you perfectly and makes me want to hop to my nearest store to find the same pair! 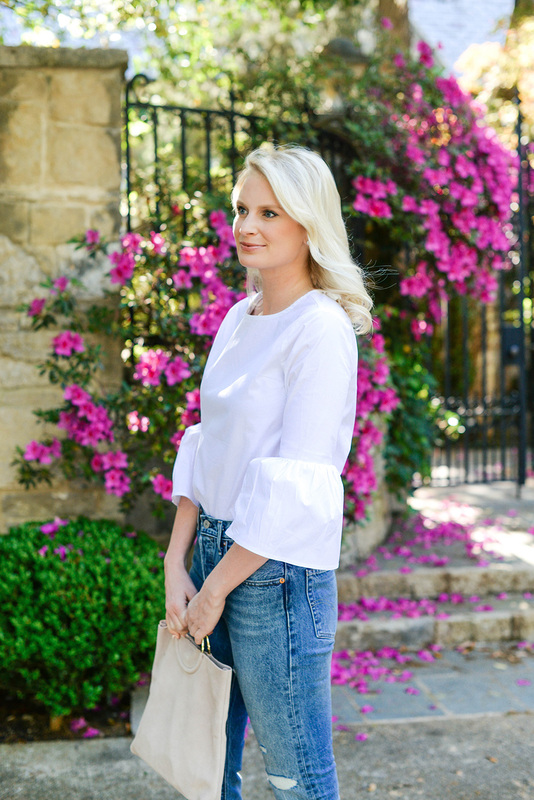 Love this classic spring look! Okay these look amazing on you! I tried them on and did not look this good in them. I do have another pair of Levis I love.